The term archangel occurs only in St. Jude and 1 Thessalonians 4:15; but St. Paul has furnished us with two other lists of names of the heavenly cohorts. He tells us (Ephesians 1:21) that Christ is raised up "above all principality, and power, and virtue, and dominion"; and, writing to the Colossians (1:16), he says: "In Him were all things created in heaven and on earth, visible and invisible, whether thrones or dominations, or principalities or powers." It is to be noted that he uses two of these names of the powers of darkness when (2:15) he talks of Christ as "despoiling the principalities and powers . . . triumphing over them in Himself". And it is not a little remarkable that only two verses later he warns his readers not to be seduced into any "religion of angels". He seems to put his seal upon a certain lawful angelology, and at the same time to warn them against indulging superstition on the subject. We have a hint of such excesses in the Book of Enoch, wherein, as already stated, the angels play a quite disproportionate part. Similarly Josephus tells us (Bel. Jud., II, viii, 7) that the Essenes had to take a vow to preserve the names of the angels. Only four appearances of Gabriel are recorded: In Daniel 8, he explains the vision of the horned ram as portending the destruction of the Persian Empire by the Macedonian Alexander the Great, after whose death the kingdom will be divided up among his generals, from one of whom will spring Antiochus Epiphanes. In chapter 9, after Daniel had prayed for Israel, we read that "the man Gabriel . . . . flying swiftly touched me" and he communicated to him the mysterious prophecy of the "seventy weeks" of years which should elapse before the coming of Christ. In chapter 10, it is not clear whether the angel is Gabriel or not, but at any rate we may apply to him the marvellous description in verses 5 and 6. In the New Testament he foretells to Zachary the birth of the Precursor, and to Mary that of the Saviour. Thus he is throughout the angel of the Incarnation and of Consolation, and so in Christian tradition Gabriel is ever the angel of mercy while Michael is rather the angel of judgment. At the same time, even in the Bible, Gabriel is, in accordance with his name, the angel of the Power of God, and it is worth while noting the frequency with which such words as "great", "might", "power", and "strength" occur in the passages referred to above. The Jews indeed seem to have dwelt particularly upon this feature in Gabriel's character, and he is regarded by them as the angel of judgment, while Michael is called the angel of mercy. Thus they attribute to Gabriel the destruction of Sodom and of the host of Sennacherib, though they also regard him as the angel who buried Moses, and as the man deputed to mark the figure Tau on the foreheads of the elect (Ezekiel 9:4). In later Jewish literature the names of angels were considered to have a peculiar efficacy, and the British Museum possesses some magic bowls inscribed with Hebrew, Aramaic, and Syriac incantations in which the names of Michael, Raphael, and Gabriel occur. These bowls were found at Hillah, the site of Babylon, and constitute an interesting relic of the Jewish captivity. In apocryphal Christian literature the same names occur, cf. Enoch, ix, and the Apocalypse of the Blessed Virgin. As remarked above, Gabriel is mentioned only twice in the New Testament, but it is not unreasonable to suppose with Christian tradition that it is he who appeared to St. Joseph and to the shepherds, and also that it was he who "strengthened" Our Lord in the garden (cf. the Hymn for Lauds on 24 March). 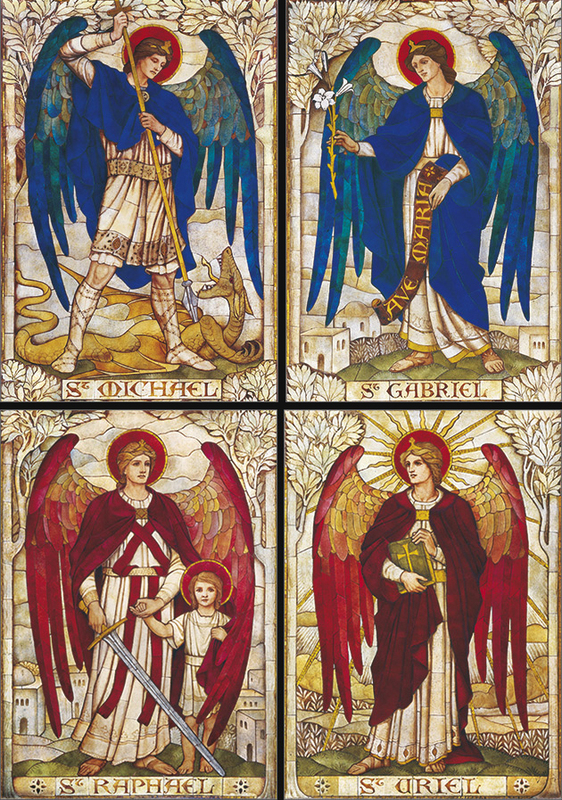 Gabriel is generally termed only an archangel, but the expression used by St. Raphael, "I am the angel Raphael, one of the seven, who stand before the Lord" (Tobit 12:15) and St. Gabriel's own words, "I am Gabriel, who stand before God" (Luke 1:19), have led some to think that these angels must belong to the highest rank; but this is generally explained as referring to their rank as the highest of God's messengers, and not as placing them among the Seraphim and Cherubim (cf. St. Thomas, I.112.3; III.30.2 ad 4um).